Over the past few years, southern cuisine has spread from down-south American locales to restaurant kitchens of cities and towns around the world. No longer do we need to visit the confederate states to taste delicious southern food. Just like bluegrass music from the South, a menu that is influenced by southern flavors like creole and cajun, along with classics like fried chicken, is soulful and distinct. If you’re interested in offering the ultimate comfort-food, seek inspiration from our American friends south of the Mason-Dixon line. To get you started, we visited three Southern-style restaurants that are knocking it out of the park with flavor, comfort and spice. After sinking our teeth into a plate of hot chicken at Hattie B’s, our taste buds could not believe the food from this southern gem. Folks that have visited Nashville know what we’re talking about. We literally had to line up outside and around the block to get our chance to eat the best hot chicken Nashville has to offer. The chicken is battered, dipped in hot sauce, battered, dipped in hot sauce once again and then deep fried. When crisp, it’s smothered in a spicy coating consisting of black and cayenne pepper, paprika and brown sugar. This hot chicken makes its fried chicken cousin look as weak as Mr. Burns. Don’t think you can handle the heat? Hattie B’s offers a range of temperatures from ‘Southern’- no heat, to ‘Shut the Cluck Up’- comes with a burn notice. No matter what level you go for, order a side of Hattie’s Homemade Coleslaw to keep it cool. In Washington and Maryland, the popular restaurant chain The Carolina Kitchen offers patrons a taste of home-style favorites, featuring a blend of Cajun and Creole spices. The menu features Ma Pearl’s Specialties like Country Fried Croaker- fried fish bone with collared greens and potato salad, the Chesapeake Platter- fried lobster tail, lump meat crab cake, fried shrimp, spicy wings and sides, and seasonal Fried Green Tomatoes- hand breaded tomato slices with parmesan cheese spicy dip. We can’t forget to mention our favorite classics like the Smothered Fried Chicken, which comes slathered in Grandma’s gravy, with fresh cornbread and collard greens. Home of the Brave in Toronto’s trendy King West neighborhood offers patrons an urban flavor with an environment of cool beats and artwork. This Canadian joint offers creative interpretations of classic American dishes. 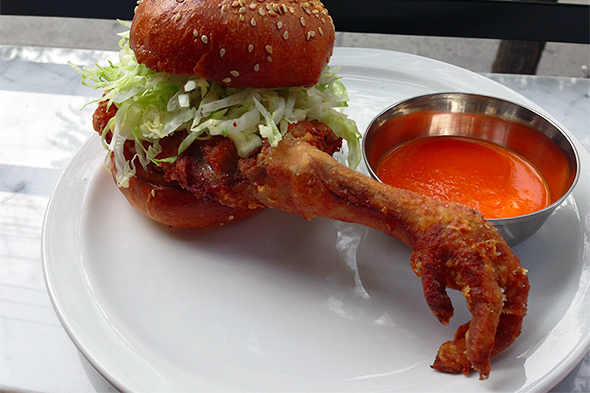 HOTB’s unique takes on southern food include the Kentucky Handshake Sandwich; a chicken burger with iceberg lettuce and Buffalo hot sauce, includes a deep-fried drumstick complete with chicken foot. It could literally shake your hand. We dove into an order of sumptuous Chicken & Waffles- with sour cream, spicy maple syrup, and green onions for toppings, and enjoyed the Buffalo Cauliflower- beer-battered and covered in Buffalo hot sauce with ranch dressing. All of these joints are dedicated to providing classic southern flavors, offering patrons a taste of homestyle, soulful eats. We expect we’ll be seeing southern-inspired dishes at more and more places around the world, and we totally get it: Adding southern influence to your menu will really spice up your business! What are your favorite southern dishes? Do you have any southern-inspired items on your menu? Have any great seasoning recipes to share with fellow readers? Inspiration and suggestions for unique tacos. Well-known chefs are proving that offal isn't awful.